I started reading The Hobbit to my daughter last night having read most of Tolkien's books in my youth, but haven't read them again for some years. In the first few pages of The Hobbit, Tolkien talks about Hobbits being less common 'these days' such that 'big folks like us' probably don't know much about them. Taken in isolation, these first few pages strongly imply that the events take place in our world, presumably many many years ago. However, this isn't the impression one gets from any of the other books, as far I can remember. Particularly The Silmarillion presents a creation story that takes some elements of the Ambrahamic faiths' creation stories, but is clearly a different story. I don't get the impression that Tolkien intends these other stories to be about our world. What was Tolkien's likely meaning behind this passage? G: I thought that conceivably Midgard might be Middle-earth or have some connection? T: Oh yes, they're the same word. Most people have made this mistake of thinking Middle-earth is a particular kind of Earth or is another planet of the science fiction sort but it's just an old fashioned word for this world we live in, as imagined surrounded by the Ocean. G: It seemed to me that Middle-earth was in a sense as you say this world we live in but at a different era. T: No ... at a different stage of imagination, yes. ‘Middle-earth’, by the way, is not a name of a never-never land without relation to the world we live in (like the Mercury of Eddison). It is just a use of Middle English middel-erde (or erthe), altered from Old English Middangeard: the name for the inhabited lands of Men ‘between the seas'. And though I have not attempted to relate the shape of the mountains and land-masses to what geologists may say or surmise about the nearer past, imaginatively this ‘history’ is supposed to take place in a period of the actual Old World of this planet. May I say that all this is ‘mythical’, and not any kind of new religion or vision. As far as I know it is merely an imaginative invention, to express, in the only way I can, some of my (dim) apprehensions of the world. All I can say is that, if it were ‘history’, it would be difficult to fit the lands and events (or ‘cultures') into such evidence as we possess, archaeological or geological, concerning the nearer or remoter part of what is now called Europe; though the Shire, for instance, is expressly stated to have been in this region (I p. 12).6 I could have fitted things in with greater versimilitude, if the story had not become too far developed, before the question ever occurred to me. I doubt if there would have been much gain; and I hope the, evidently long but undefined, gap in time between the Fall of Barad-dûr and our Days is sufficient for ‘literary credibility’, even for readers acquainted with what is known or surmised of 'pre-history'. I have, I suppose, constructed an imaginary time, but kept my feet on my own mother-earth for place. I prefer that to the contemporary mode of seeking remote globes in ‘space’. However curious, they are alien, and not lovable with the love of blood-kin. Middle-earth is (by the way & if such a note is necessary) not my own invention. It is a modernization or alteration (N[ew] E[nglish] D[ictionary] ‘a perversion’) of an old word for the inhabited world of Men, the oikoumenē: middle because thought of vaguely as set amidst the encircling Seas and (in the northern-imagination) between ice of the North and the fire of the South. O.English middan-geard, mediæval E. midden-erd, middle-erd. Many reviewers seem to assume that Middle-earth is another planet! As for the shape of the world of the Third Age, I am afraid that was devised ‘dramatically’ rather than geologically, or paleontologically. I do sometimes wish that I had made some sort of agreement between the imaginations or theories of the geologists and my map a little more possible. I imagine the gap [between TA and now] to be about 6000 years: that is we are now at the end of the Fifth Age, if the Ages were of about the same length as S.A. and T.A. But they have, I think, quickened; and I imagine we are actually at the end of the Sixth Age, or in the Seventh. In (5) we meet the conception of the dragging of Tol Eressëa back eastwards across the Ocean to the geographical position of England - it becomes England (see I.26); that the part which was torn off by Ossë, the Isle of Íverin, is Ireland is explicitly stated in the Qenya dictionary. The promontory of Rôs is perhaps Brittany.. So, as the other answers have already said, albeit with fewer citations, not only is Middle-earth in our own universe, it is on our own planet, and eventually became what we now know as Europe. The Shire became the British Isles (Great Britain and Ireland). 1This was among the earliest writing Tolkien did regarding Middle-earth, and later, he decided against the idea of "dragging" an island to the current location of the British Isles; instead, he chose to say that the seas eventually rose and surrounded the Shire, turning it into the British Isles. According to the understanding of his friend, C.S.Lewis, the legend of Numinor took place in our universe. In fact, he referred to Numinor several times over the course of his book That Hideous Strength in his Space Trilogy, which was set in post-war England. Those who would like to learn further about Numinor and the True West must (alas!) await the publication of much that still exists only in the MSS of my friend, Professor J. R. R. Tolkien. In That Hideous Strength, Merlin was brought back by the antagonists as the last vestige of the days of Numinor before the "Great Disaster." He proves to be unsympathetic towards them. With the encouragement of the protagonist, he channels the power of the Valar represented as Greek gods, and hilarity ensues. Taken as a whole I would have to say no - I personally do not believe it is meant to be Earth. I personally choose to take the whole cosmology on face value - yes, for the majority of its existence Ea was a flat plane, latterly sailed over by two ships of the moon and sun. Yes, it became a sphere after the Downfall of Numenor - but was still orbited by the same ships. SOME commentators and readers however take the view that the cosmology was as largely made up as our own religions and it was as much a planet as our own is, in orbit around the sun and so on. Tolkien himself even sometimes dithered in that direction as mentioned in various letters and also Morgoth's Ring. I suppose if you take the latter view then yes, you can say Tolkien intended the stories to have happened here on earth, but in vanishingly distant pre-history. In fact some of the earliest stories and early forms of later stories emphatically DO occur on earth. In the Book of Lost Tales for example, many legends are told to the Anglo Saxon sailor 'Aelfwine' who miraculously finds the 'straight path' which in later versions of the mythos is the exclusive ability of Cirdan's and other ships to follow. Moreover these stories are recognizable, or at least carry recognizable hints to the - to be - 'what really happened' history that was incorporated into the appendices, the tale of years, unfinished tales, the silmarillion and so on. At the end of the day the frustrating answer is - or can be - YES, its Earth if you want it to be and NO if you don't. I enjoy the latitude this give me as a lifelong Tolkien-nut. The case of 'Numenor' is a special one AND an interesting one. It began as an attempt to write a modern version of the Atlantis legend. MOST interestingly it is a story WITHIN a story that unfolds during a meeting of 'The Notion Club' - a reflection of the real-world inklings - in an almost Wellsian setting. Moreover how this inner-story actually reaches the characters of the story is through a process called 'true dreaming' which really might as well be patterned after the 'real' parapsychological phenomena 'remote viewing'!!! AND some of the events supposedly learned through this hypnogogic process bear VERY close relation to events which happened in real life long after Tolkien wrote the story - the 'Great Storm' of 1987, the 'Great Explosion' which can be likened to the Chernobyl disaster and so on... Nothing more than an interesting addendum of course, but I have read more than one conspiracy-nut make a big deal of it. 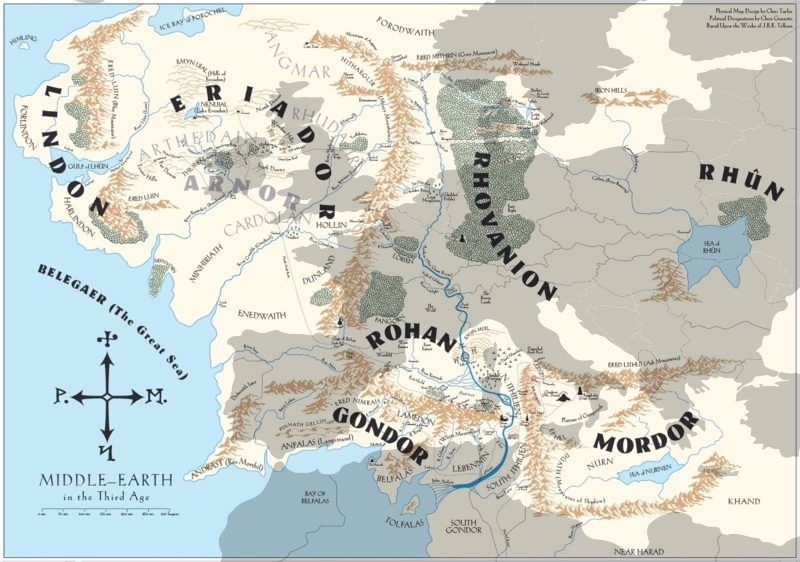 Where is Middle-earth and is it flat or curved? What marked the end of Tolkien's fourth age? What modern day items are mentioned in JRRT's writings? Is there evidence of purely artistic works in Middle Earth? How can Tolkien's characters see stars during the daytime? Has Tolkien's estate ever sold the rights to adaptations of any Tolkien works?